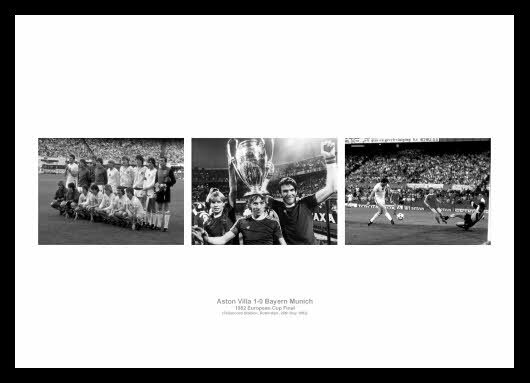 A montage celebrating one of the greatest moments in Villa's history - their 1982 European Cup 1-0 victory over Bayern Munich. This gives the Villa fan a perfect memento the event and the players of that era. The photos featured are: The Aston Villa team lining up before the final; Gary Shaw, Tony Morley and scorer of the winning goal Peter Withe celebrating with the trophy after the match; and Peter Withe's goal that won the European Cup.